編輯和增強成像魔術效率更高最先進的攝影工具使用 Adobe Camera Raw 控制色彩和色調專業處理圖像直觀地創建電影和視頻內容創建出色的設計和藝術作品具有高級功能的複合圖像利用簡化的工作流程以用戶啟發式改進節省時間擴大您的覆蓋面注意：30 天試用。 2 GB 的雲存儲。有限訪問服務和嘮叨屏幕. - Select Subject lets you select the most prominent subject in an image in a single click. Powered by advanced machine learning technology, Select Subject is trained to identify a variety of objects in an image—people, animals, vehicles, toys, and more. - Using the Surface Dial with Photoshop, you can adjust tool settings without ever looking away from the canvas. Use the Dial to adjust size, opacity, hardness, flow, and smoothing for all brush-like tools. Using the Control option, you can also rotate the dial to make dynamic adjustments to settings while a brush stroke is in progress. Photoshop supports the Surface Dial on bluetooth-enabled computers running Windows 10 Fall Creator’s release (version 1709) and later versions. 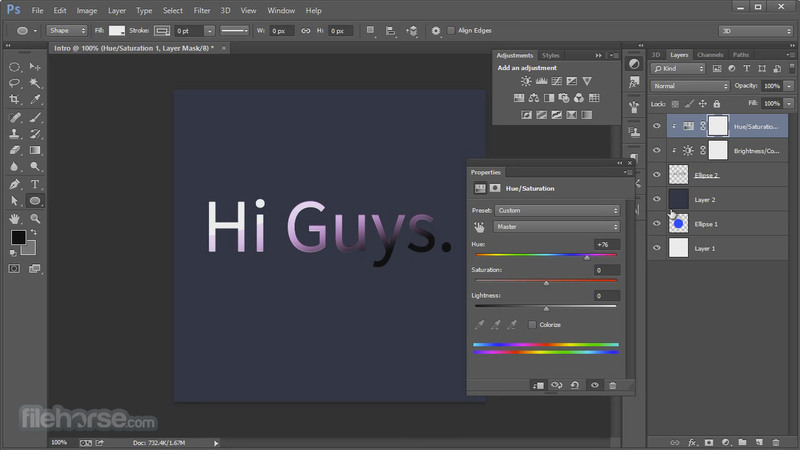 - Photoshop can now perform intelligent smoothing on your brush strokes. Simply enter a value (0-100) for Smoothing in the Options bar when you're working with one of the following tools: Brush, Pencil, Mixer Brush, or Eraser. A value of 0 is the same as legacy smoothing in earlier versions of Photoshop. Higher values apply increasing amounts of intelligent smoothing to your strokes. - Working with brush presets is much easier in this release of Photoshop. You can now organize brush presets into folders—including nested folders—in the greatly-streamlined Brushes panel (renamed from Brush Presets in earlier releases). - You can now choose to work with and manage brush-enabled tool presets and their attributes, accessible only from the Options bar in earlier releases of Photoshop, in the Brushes panel. Any brush-enabled tool preset can be converted into a brush preset; all of its attributes—such as opacity, flow, and blending mode—are preserved. Once you've converted brush-enabled tool presets into brush presets, you can choose to remove them from the tool presets list. - You can now access all of your synced Lightroom photos directly from the Start workspace within Photoshop. In the Start workspace, click the Lr Photos tab. Now, select the images you want to open and click Import Selected. If you've made changes to your photos or albums in any of the Lightroom apps while Photoshop is running, click the Refresh button to see the changes you’ve made. Click See More to view a grid of all of your photos organized by date. - Aside from the Start workspace, you can also find, filter, sort, and import Lightroom photos into Photoshop using the in-app search experience. - Photoshop now supports Variable Font, a new OpenType font format supporting custom attributes like weight, width, slant, optical size, etc. This release of Photoshop ships with several variable fonts for which you can adjust weight, width, and slant using convenient slider controls in the Properties panel. As you adjust these sliders, Photoshop automatically chooses the type style closest to the current settings. For example, when you increase the slant for a Regular type style, Photoshop automatically changes it to a variant of Italic. - You can now email or share your creations to several services directly from within Photoshop. When you share a document by email, Photoshop sends out the original document (.psd file). For certain services and social media channels, Photoshop automatically converts the document to the JPEG format before sharing. - The Curvature Pen tool lets you draw smooth curves and straight line segments with equal ease. Create custom shapes in your designs or define precise paths to effortlessly fine-tune your images using this intuitive tool. While doing so, create, toggle, edit, add, or remove smooth or corner points without ever having to switch tools. - Path lines and curves are no longer just in black and white! You can now define the color and thickness of path lines to suit your taste and for easier visibility. - While creating a path—using the Pen tool, for example—click the gear icon () in the Options bar. Now specify the color and thickness of path lines. Also, specify whether you want to preview path segments as you move the pointer between clicks (Rubber Band effect). - While using stroke smoothing, you may choose to view the brush leash, which connects the current paint location with the present cursor position. Select Preferences > Cursors > Show Brush Leash While Smoothing. You can also specify a color for the brush leash. - You can now copy and paste layers in Photoshop—within a document and between documents—using the Copy, Paste, and Paste Into Place commands. - When you paste a layer between documents with different resolutions, the pasted layer retains its pixel dimensions. Depending on your color management settings and the associated color profile, you may be prompted to specify how to handle color information in the imported data. - Figuring out what Photoshop tools do is now easier than ever before! When you hover the pointer over certain tools in the Tools panel, Photoshop displays a description and a short video of the tool in action. - Using the new Color Luminance Range Masking controls, you can quickly create a precise masking area on your photo for applying local adjustments. These new precision masking tools can detect changes in lighting and contrasting edges based off color and tone. You can make quick initial masking selections with Adjustment Brushes or Radial Filter/Graduated Filter. Then refine your selection with the range masks, located under Auto-Mask in the Adjustment Brush tool options. - After making an initial selection mask on your photo with Adjustment Brushes or Radial Filter/Graduated Filters, use Color Range Masking to refine the selection mask based on the colors sampled within the mask area. - After making an initial selection mask on your photo with Adjustment Brushes or Radial Filter/Graduated Filters, use Luminance Range Masking to refine the mask area based on the luminance range of the selection. - Composer Switching: You can now change the text composer on a per-document basis from the Paragraph panel. This feature makes it easy to reuse assets even across languages that use different composers—for example, Middle Eastern and East Asian languages. - Photoshop now supports Apple's High Efficiency Image Format (HEIF). Photoshop can read depth maps in HEIF image files created by iPhone 7 Plus and later devices into a channel. You can then create a depth-of-field effect in the image using Filter > Blur > Lens Blur. - New preference on Windows 10: Preferences > Workspace > Align UI According To OS Settings. Use this preference to prevent contextual UI elements, such as pop-up menus, from displaying beneath your hand when you're drawing directly on the display. This operating system setting is controlled from Ink & Stylus system preferences on Windows. It is available only on devices paired with a stylus. - While pasting text into type layers, you can now use the new Edit > Paste > Paste Without Formatting command. This command strips out style attributes from the source text and adapts it to the style of the destination type layer. - In-app search experience now also lets you find, filter, sort, and import Lightroom photos into Photoshop. - Collapsed font menus: The font lists in the Options bar and various panels now show all the font faces in a given family collapsed into a pop-up submenu accessible via either the mouse or the keyboard. - The Brush panel in earlier releases of Photoshop is now called Brush Settings. - The Brush Presets panel in earlier versions of Photoshop has been streamlined and renamed as Brushes panel. For more information, see Streamlined brush preset management. - Device Preview is no longer available in this release. Additionally, the Preview CC iOS app is no longer available for download or actively maintained as of October 2017. If you have a previously-downloaded version of Preview CC on your iOS device, you can continue to use it on an as-is basis with earlier versions of Photoshop. - Photoshop no longer prompts you to import assets into Creative Cloud Libraries while opening documents. You can still automatically import all assets from an open document using the Create New Library From Document command in the Libraries panel. - The Preferences > General > Show Recent Files Workspace When Opening A File setting is no longer available. - On macOS 10.13 (High Sierra) and newer, Photoshop uses a dark title bar for floating document windows when UI brightness is set to one of the two dark settings. - Photoshop now supports Touch Bar, the multitouch display at the top of the new MacBook Pro keyboard. Touch Bar support in Photoshop is currently a technology preview feature. - Now, when you create a document in Photoshop, instead of beginning with a blank canvas, you can choose from a wide variety of templates from Adobe Stock. Templates include stock assets and illustrations that you can build on to complete your project. When you open a template in Photoshop, you can work with it just as you would work with any other Photoshop document (.psd). - In addition to templates, you can also create a document by selecting one of the numerous presets available in Photoshop or create your custom sizes. You can also save your own presets for reuse. - Photoshop supports OpenType SVG fonts and ships with the Trajan Color Concept and the EmojiOne font. OpenType SVG fonts provide multiple colors and gradients in a single glyph. Emoji fonts are an example of OpenType SVG fonts. Using Emoji fonts, you can include various colorful and graphical characters, such as smileys, flags, street signs, animals, people, food, and landmarks in your documents. OpenType SVG emoji fonts, such as the EmojiOne font, let you create certain composite glyphs from one or more other glyphs. - The Polygonal Lasso tool is now available in the workspace. This tool works just like the corresponding tool in classic Photoshop. - High-quality refined previews on mouse down. Optionally, if necessary, you can switch to low-resolution previews for better interactivity. - While sharing libraries and library assets, choose to let other users follow them. Whenever you update the library or the library asset, followers automatically get the updates across all supported Creative Cloud apps. - Additional properties are now displayed in the Properties panel for type layers. You can modify some text settings directly from from the Properties panel. - Preference to select a highlight color in the UI: Blue or Gray. Select Preferences > Interface and, under Appearance, choose a Highlight Color. - In earlier releases of Photoshop, Cmd/Ctrl+F used to be the keyboard shortcut for reapplying the last-used filter. Beginning with this release, it invokes the Photoshop search experience. If necessary, you can use Edit > Keyboard Shortcuts to reassign keyboard shortcuts. - Auto-Select is now the default setting for the layer Move tool. You can revert to the default setting in earlier versions of Photoshop: in the Options bar, deselect Auto-Select and choose Group from the pop-up menu. - Don't open an OS window after "Quick export as PNG"
- The Liquify filter now features advanced face-aware functionality that automatically identifies eyes, noses, mouths, and other facial features, making it easy for you to adjust them. Face-Aware Liquify is great for retouching portrait photos, creating caricatures, and doing much more. - You can use Face-Aware Liquify as a smart filter for non-destructive editing. Select Filter > Liquify and then choose the Face () tool in the Liquify dialog. - Creating accurate selections and masks in Photoshop is now quicker and easier than ever before. A dedicated new workspace now helps you make precise selections and masks. Use tools like Refine Edge Brush to cleanly separate foreground and background elements and do much more. - To invoke the workspace, click Select And Mask in the Options bar when a selection tool is enabled. Alternatively, press Ctrl+Alt+R (Windows) or Cmd+Option+R (Mac). 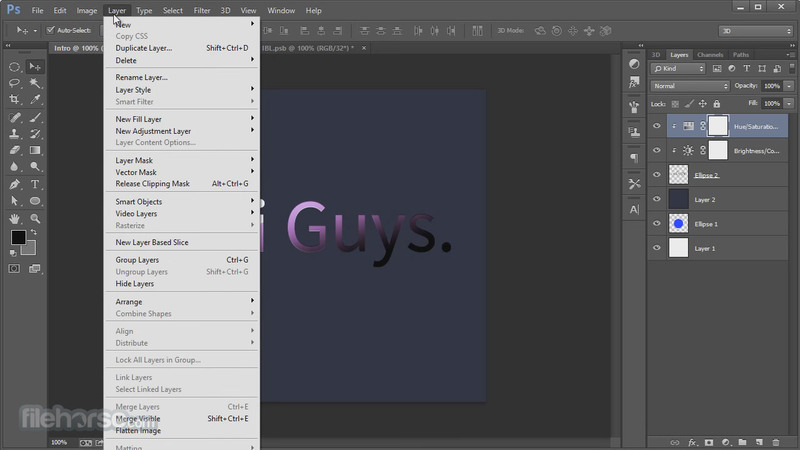 - Take the guesswork out of identifying certain fonts and let Photoshop CC do the hard work for you. Thanks to the magic of intelligent imaging analysis, using just a picture of a Latin font, Photoshop CC can use machine learning to detect which font it is and match it to licensed fonts on your computer or on Typekit, suggesting similar fonts. - Simply select the area of the image containing the text whose font you want to analyze. Now, select Type > Match Font. - Photoshop CC now uses content-aware technology to intelligently fill in the gaps when you use the Crop tool for rotating or straightening an image, or expanding your canvas beyond the image's original size. - While using the Crop () tool, select Content-Aware in the Options bar. 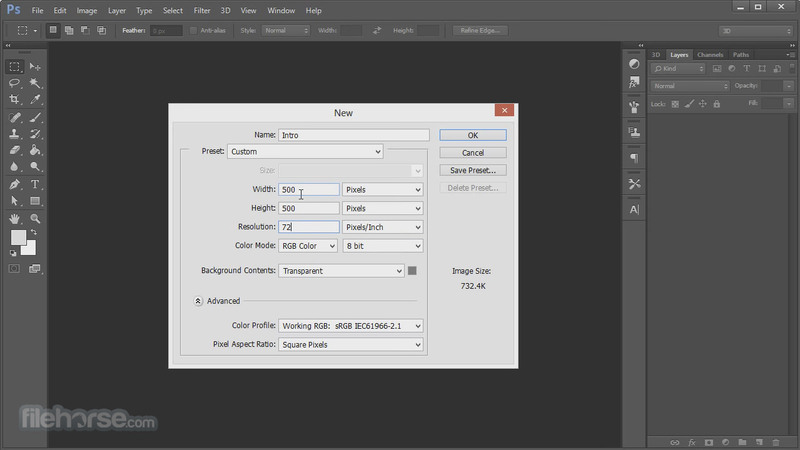 - You can now open assets in Photoshop directly from the Adobe Stock website. Also, licensing watermarked previews while working in Photostop is now easier than ever before. License previews from the Layers panel, the Properties panel, or from the canvas; simply right-click the stock asset and then select License Image. - Finding the right stock asset for your project is now also a breeze. Use the new filtered search on the Adobe Stock website and within your libraries. Licensed Adobe Stock assets are badged for easy identification; video assets now have linked previews. - Embed color profiles into PNG or JPG files using the Export As dialog. Select File > Export > Export As or right-click a layer in the Layers panel and then select Export As. 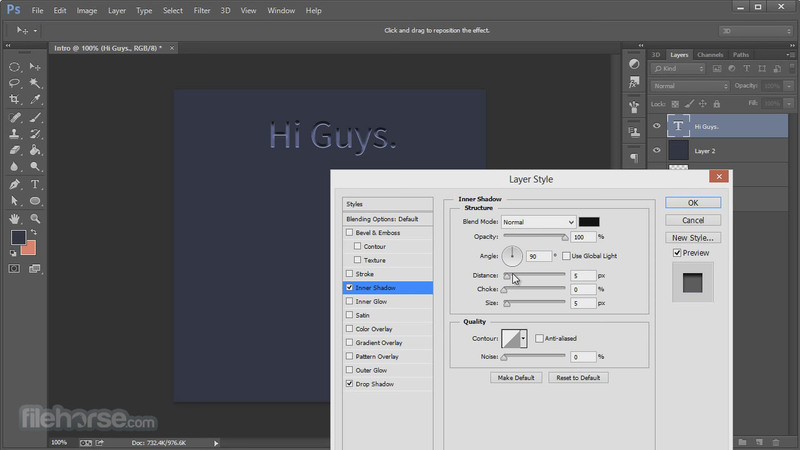 - When you select a glyph in a Type layer, Photoshop now displays the available glyph alternatives right on the canvas. Clicking the icon in the alternatives grid opens the Glyphs panel. - If necessary, you can turn off this behavior. To do so, deselect Preferences > Type > Enable Type Layer Glyph Alternates. - You can now print 3D models as 3D Manufacturing Format (3MF) files. While specifying the 3D Print Settings, select Print To: Local and Printer: 3MF File. - You can now duplicate a layer or layer group into other artboards, quickly change artboard backgrounds, and view artboards with transparent backgrounds. - If you've specified an artboard background, you can now also include it while exporting the artboard as PDF or supported image formats. While exporting the artboard as PDF, you can also include the artboard name and set custom font size, font color, canvas extension color, etc. - Photoshop CC now opens documents faster and delivers great responsiveness. Content-Aware Fill is now up to 3X faster with even better results. The Font menu loads up the list of fonts up to 4X faster. - You can now share libraries with anyone who has a Creative Cloud account. While adding collaborators to a library, choose what level of permissions you want to give them. For example, you can allow others on your team to use shared assets in their designs but not modify those assets. - Copy and paste your Photoshop CC assets directly into Adobe XD, the new all-in-one tool for designing and prototyping user experiences for websites and mobile apps. - Use Adobe Portfolio to quickly and easily create a beautiful portfolio site to show off your Photoshop images. And now when you use Portfolio, you can create custom landing and contact pages to better connect with viewers. - Option to revert to the legacy Photoshop CC 2014 behavior for the Healing Brush tool. Select Preferences > Tools > Use Legacy Healing Algorithm For Healing Brush. - For easier navigation, variants of a font—such as Bold and Italics—are now grouped under the same item in font lists. You can expand the item and select the desired variant. While navigating the fonts, you can even expand more than one item in the list. - Fonts are now grouped by font family. The Show Similar Fonts option now also displays fonts from Typekit. - The document layer count is now displayed in the status box and the Info palette. - Help > System Info now shows the full file path for optional and disabled plug-ins. - The Spot Channel dialog now includes names of colors selected from the Swatches palette. - Name or color value is now displayed in the tooltip for recently-used colors in the Swatches palette. - The Color Adaptation setting is now enabled by default in the Fill dialog (Edit > Fill). Also, the color adaptation feature has been optimized for better results in this release. - 3D, 3D Printing, and some other features in Photoshop are no longer supported on 32-bit platforms. See Features unsupported on 32-bit platforms. - The Photoshop-Behance integration has been removed in this version. When you select File > Share On Behance, you are taken to https://www.behance.net, where you can click Add Work to post your creative work. - The Select and Mask workspace replaces the Refine Edge dialog in earlier versions of Photoshop, offering the same functionality in a streamlined way. - On Mac OS X, printing documents on inkjet printers results in unexpected color output. See this knowledge-base article. - Audio issues while playing clips encoded with Dolby Audio. See this knowledge-base article. - New Creative Cloud Libraries capabilities: Find content faster by searching across your libraries and across Adobe Stock. Drag and drop assets to and from the Layers panel, add your favorite brushes and share your library with others. And get content into libraries faster with a new bulk import dialog box. - Design Space (Preview) enhancements: This dedicated mode further streamlines and optimizes design workflows with a unified sampling experience, efficient masking, robust app and cross-document search and integrated layer and batch export. Design Space (Preview) offers access to Creative Cloud Libraries as well as seamless movement to and from standard Photoshop CC. - Do more with artboards: Use artboard guides and grids to precisely place elements, sort layers by artboard for easier visualization and quickly add new artboards to documents. Use artboard preferences to customize the look and feel of your documents. - Modern user experience on desktop and touch devices: The updated UI delivers a clean and consistent look throughout Photoshop, and you can quickly perform common tasks using a new set of gestures on touch-enabled devices like Microsoft Surface Pro. - Customizable toolbar and workspaces: Make Photoshop yours by customizing your toolbar and saving multiple toolbar configurations as parts of different workspaces. Included workspaces have been streamlined to give you quick access to only the tools you need. - Find fonts faster: Quickly find the font you need by starring individual fonts as favorites. Narrow down your search by filtering fonts by classification, like serif or sans serif, or by similarity. - Export faster with more control: The exporting experience introduced in June now delivers faster performance and better compression for all file formats, especially JPEG; the ability to export the same assets at multiple sizes; support for sRGB export; and options to embed metadata such as copyright into your files during export. - More creative options with SVG import: Open and place native SVG files — which can rescale for any size device or any resolution — in your Photoshop designs. Just double-click the object to edit it in Adobe Illustrator. - Quickly find the right glyph: The Glyph panel now lets you see and insert your most recently used glyphs and sort glyphs for faster browsing. - More control with Adobe Camera Raw 9 enhancements: Remove or add atmospheric haze in specific areas of your photos using the Local Adjustment Brush, Radial Filter and Graduated Filter. Plus, use the new Bird’s Eye View feature to navigate zoomed-in images, and get support for more cameras and lenses. - The ability to see and edit type layer position in the Properties panel; reintroduction of the Oil Paint filter; the ability to resize the Export dialog; Device Preview connectivity improvements; a preset value of 16pt in the Font Size dropdown menu. - If you are a web or UX designer, you increasingly find yourself designing websites or apps for multiple devices. Artboards, new in the 2015 release of Photoshop CC, help streamline your design process by giving you an infinite canvas on which you can lay out designs for different devices and screens. While creating artboards, you can choose from a wide variety of preset sizes or define your own custom artboard size. - Artboards are useful even if you normally design for just one screen size. For example, while designing a website, you can use artboards to view designs for different pages side-by-side and in context. - When you use a graphic from the Libraries panel, a library-linked asset is created. This asset behaves in much the same way as a locally-linked smart object, but with the benefit of the asset being in the cloud. Also, when you create a new library graphic from a smart object, the corresponding layer is converted to a library-linked asset. - You can now add a watermarked stock image to any of your libraries directly using the Adobe Stock website. You can then use the watermarked image in your Photoshop documents as a library-linked asset. When you choose to license the image—which you can do directly from within the Libraries panel—all instances of the watermarked asset in your open documents are updated to the high-resolution licensed image. - Libraries integration with Photoshop now offers reduced disk usage, more efficient bandwidth utilization, and faster propagation of library changes between Creative Cloud applications. - Adobe Stock is a new service that provides designers and businesses with access to 40 million high-quality, curated, royalty-free images, illustrations, and vector graphics for all their creative projects. You can search for Adobe Stock content directly from within Photoshop. Select File > Search Adobe Stock. - Adobe Stock is also deeply integrated with Creative Cloud Libraries. You can now add a watermarked stock image to any of your libraries directly using the Adobe Stock website. You can then use the watermarked image in your Photoshop documents as a library-linked asset. When you choose to license the image—which you can do directly from within the Libraries panel—all instances of the watermarked asset in your open documents are updated to the high-resolution licensed image. - Design Space (Preview) is aimed at becoming a modern design experience inside Photoshop streamlined for the requirements of web, UX and mobile app designers. It's an HMTL5/CSS/JS layer built on top of Photoshop. We’ve separated out standard Photoshop from the interface so that we can use this layer to create new UI, smarter interactions, and top-requested features. This release is a Technology Preview, which means it's an early look at this new direction. It's rough and there is a limited feature set but we want to get this out early so that we can start hearing from you. - To enable Design Space (Preview), select Preferences > Technology Previews and then choose Enable Design Space (Preview). - You can now export artboards, layers, layer groups, or Photoshop documents as JPEG, GIF, PNG, PNG-8, or SVG image assets. - The Layer Style dialog now lets you apply multiple effects—strokes, inner shadows, color overlays, gradient overlays, drop shadows, etc—to a single layer style. Also, more than one instance of some effects can now be applied to a layer style. - In Photoshop, select an option from the Layer > Layer Style submenu. - Select the effects that you want to add to the layer style. Notice that some effects have a icon, indicating that they can be applied more than once in the layer style. - Adjust the settings for the effects. For example, adjust the size and opacity of a stroke. - Click OK to apply the effects to the layer style. - Get real-time previews of your Photoshop designs on multiple iOS devices with the new Device Preview feature in Photoshop and the Adobe Preview CC mobile app. 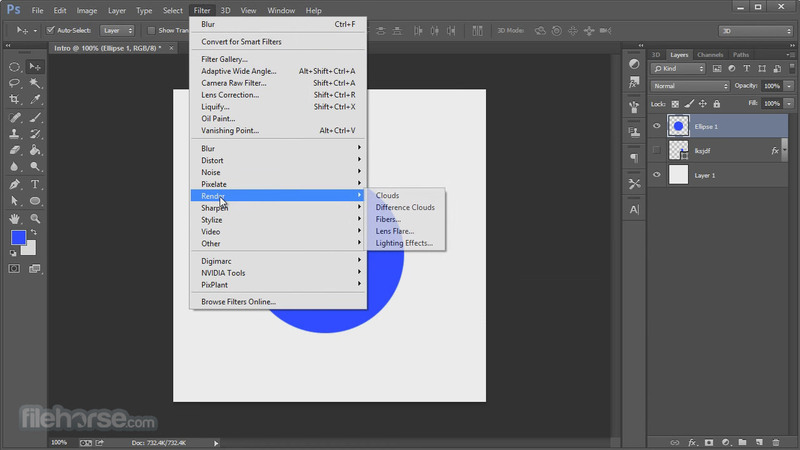 Changes you make in Photoshop CC are displayed in Preview CC in real time. You can reliably connect multiple iOS devices to Photoshop using USB or over Wi-Fi. - If you have a document with artboards, Device Preview attempts to show you the correct artboard by matching the size and position of the artboard with the size of the connected device. You can also use the navigation bar to preview a specific artboard on the device or swipe through artboards that have matching widths. - Sometimes, after applying a Blur Gallery effect, the blurred area of the image looks synthetic or unnatural. You can now restore noise/grain to such a blurred image area to give it a more realistic appearance. Set the options on the Noise tab in the blur Effects panel. - Select Type > Panels > Glyphs Panels. - Select Windows > Glyphs. - Control bump map depth. You can now control the depth or height of bump maps for printing. - Updated PLA profile for Makerbot. The Makerbot PLA profile has been updated for more reliable print outs. - The 3D menu now has a new command (3D > Simplify Meshes) that lets you reduce the number of triangles in a mesh to a more manageable number. The command algorithmically reduces the number of triangles to the number you specify while attempting to maintain the fidelity of the model. This enhancement is useful for reducing the complexity of a file in preparation for 3D printing. You can view a live preview of mesh simplification changes before they're implemented. - Improved export UI. The UI for exporting 3D layers as Collada DAE, Flash 3D, Google Earth KMZ, 3D PDF, STL, U3D, VRML, and OBJ formats is now improved. - Export a single mesh. A 3D scene typically comprises many elements or meshes. You can now right-click a mesh in the overall scene and export it individually. Right-click the mesh in the 3D Panel and then choose Export Mesh from the context menu. This functionality currently exports meshes only in Collada or KMZ formats. - Generate better bump maps and normal maps. Photoshop now lets you tweak your bump or normal maps using tools like Blur, Detail Scale, and High/Medium/Low Frequency. - Create bump maps or normal maps from diffuse textures. You can now create bump maps or normal maps from diffuse textures. The texture attached to the diffuse texture is automatically loaded as filters for the purpose of creating bump maps or normal maps. Once you're satisfied with the way your map is looking, Photoshop applies the generated bump map or normal map to those textures. - Convert a vertex color to a texture color. 3D-scanned PLY files typically have vertex colors and no textures. You can convert a vertex color to a texture color. - The UI toolkit for building Photoshop plug-ins and scripts has been enhanced to support HiDPI/Retina displays. Also, plug-ins built using the toolkit now look more consistent with the overall Photoshop UI. - The Content-Aware Move tool now has a Transform On Drop option. When this option is enabled, you can scale the part of the image that you've just moved to its new location. - Preference panels have been reworked for better organization. - New command to release all RAM and scratch disk use; hold down the Option/Alt key and select About Photoshop. Alternatively, select Edit > Purge > All. - The Photomerge dialog now has a Content Aware Fill Transparent Areas option. Use this option to give your panoramas that picture-perfect finish. - Most adjustments (Image > Adjustments) can now be applied as smart filters. Convert the layer to a smart object and then apply an adjustment to it. - Moving a layer to a group now moves it to the top of the Z-order instead of the bottom. - Step backward/forward operations no longer change the layer selection. - Experimental Features are now called Technology Previews. 10 小時前 - Adobe Photoshop CC 2018 for perfecting your images, offers productivity and workflow enhancements, powerful editing tools, compositing capabilities. How can I download and install 32 bit version on 64 bit win10?